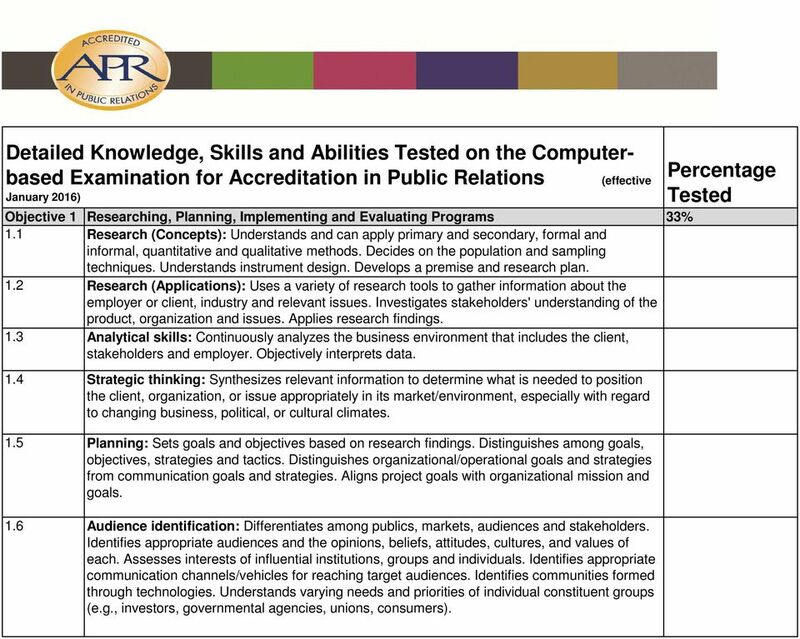 Download "Detailed Knowledge, Skills and Abilities Tested on the Computerbased Examination for Accreditation in Public Relations (effective January 2016)"
2 1.7 Diversity: Identifies and respects a range of differences among target audiences. Researches and addresses the cultural preferences and/or needs and barriers to communication of target audiences. Develops culturally and linguistically appropriate strategies and tactics. 1.8 Implementation: Understands sequence of events. Develops timelines and budget. Assigns responsibilities. Executes planned strategies and tactics. 1.9 Evaluation of programs: Determines if goals and objectives of public relations program were met and the extent to which the results or outcomes of public relations programs have been accomplished. Uses evaluation results for future planning. Objective 2 Applying Ethics and Law 13% 2.1 Integrity: Conducts professional activities in a lawful and principled manner. Functions as the conscience of the organization. 2.2 Ethical behavior: Understands and adheres to commonly accepted standards for professional behavior. Recognizes ethical dilemmas. Acts to remedy unethical acts. 2.3 First Amendment issues: Understands First Amendment as a foundational principle for public relations. Distinguishes between political and corporate speech. Articulates conditions for libel and defenses thereof. Understands impact of digital record on status as public and private figure. 2.4 Privacy issues: Understands federal law regarding privacy (e.g. HIPAA, FERPA, DPPA), identity protection, ethical implications and digital record. 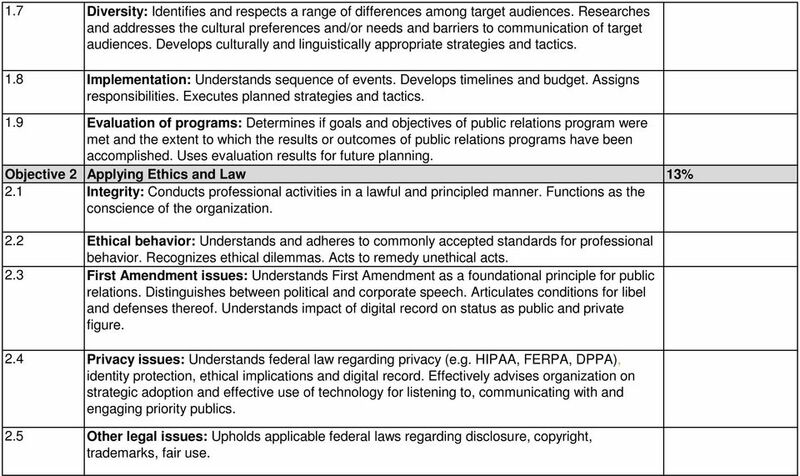 Effectively advises organization on strategic adoption and effective use of technology for listening to, communicating with and engaging priority publics. 2.5 Other legal issues: Upholds applicable federal laws regarding disclosure, copyright, trademarks, fair use. 3 Objective 3 Managing Issues and Crisis Communications 13% 3.1 Issues and risk management: Identifies potential or emerging issues that may impact the organization. Identifies potential risks to the organization or client. Analyzes probability and potential impact of risk. Ensures organization develops appropriate response plans. Designs and deploys a strategic public relations response. 3.2 Crisis management: Understands the roles and responsibilities of public relations at the precrisis, crisis, and post-crisis phases. Communicates the implications of each of these phases and understands the messaging needs of each. Looks beyond current organizational mindset. 3.3 Counsel to management: Understands the importance of providing counsel to the management team or client regarding issues, risks and crises. Looks beyond the current organizational mindset Considers and accommodates all views on an issue or crisis. Factors views into communication strategy. Objective 4 Understanding Communication Models, Theories and History of the Profession 8% 4.1 Communication/public relations models and theories: Demonstrates familiarity with social science theories and research that guide planning, prioritizing audiences, developing messages, selecting spokespeople, establishing credibility and trust. 4.2 Barriers to communication: Understands how messages and messengers are interpreted by different audiences. Understands barriers that prevent changes to knowledge, attitude and behavior. Understands how semantics, cultural norms, timing, context and related factors impact the practice. 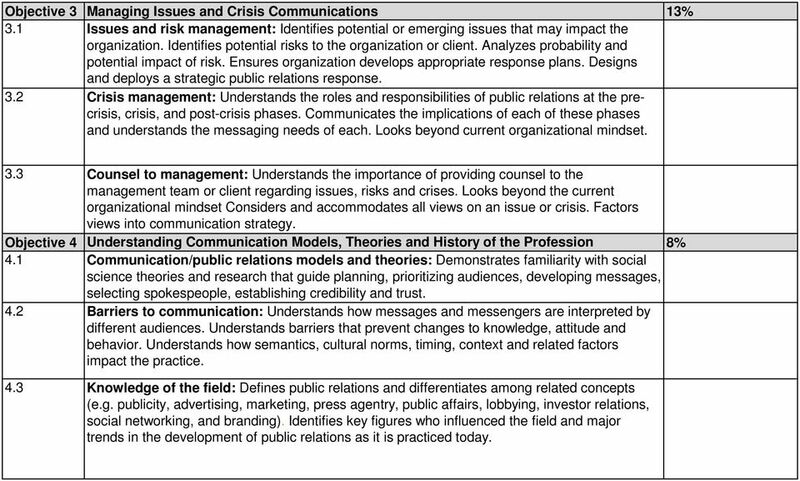 4.3 Knowledge of the field: Defines public relations and differentiates among related concepts (e.g. publicity, advertising, marketing, press agentry, public affairs, lobbying, investor relations, social networking, and branding). Identifies key figures who influenced the field and major trends in the development of public relations as it is practiced today. 4 Objective 5 Leading the Public Relations Function 18% 5.1 Business literacy: Understands and explains how employers/clients generate revenue and how their operations are conducted. Identifies relevant business drivers and how they impact the business. Understands how the public relations function contributes to the financial success of the organization. 5.2 Resource management: Takes into account human, financial and organizational resources. Prepares, justifies and controls budgets for departments, programs, clients or agencies. Understands what information needs to be collected, evaluated, disseminated, and retained. Is able to obtain information using innovative methods and appropriately store it, so that it can be retrieved easily for future use. 5.3 Organizational structure and resources: Recognizes chain of command, including boards of directors, senior leadership, middle management, direct line supervision, line positions, and each level s distinctions. Knows how organizations are horizontally and vertically structured. Identifies which divisions within an organization that need to be involved in any communication program. Understands impact of organizational governance. Recognizes the relationships among PR, legal, finance and IT, as essential management functions. 5.4 Problem solving and decision making: Approaches problems with sound reasoning and logic. Distinguishes between relevant and irrelevant information. Evaluates opportunities for resolution. Devises appropriate courses of action based on context and facts. Makes sound, well-informed and objective decisions in a timely manner. Assesses the impact and implications of these decisions. 5.5 Leadership skills: Influences others to achieve desired goals. Motivates and inspires others, builds coalitions and communicates vision. Influences overall organizational changes in policy, procedures, staffing and structure, as appropriate. 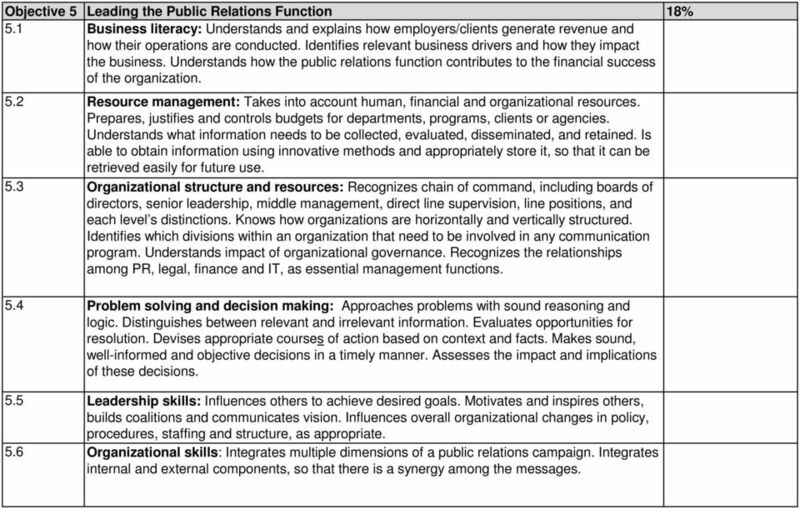 5.6 Organizational skills: Integrates multiple dimensions of a public relations campaign. Integrates internal and external components, so that there is a synergy among the messages. 5 Objective 6 Managing Relationships 15% 6.1 Relationship building: Understands consensus-building strategies and techniques to persuade key stakeholders to support a decision. Ensures discussions allow key stakeholders the opportunity to express opinions. Recognizes need for affected parties and stakeholders to find mutually acceptable solutions. Utilizes persuasion, negotiation and coalition building. 6.2 Reputation management: Understands need for maintaining individual and organizational credibility with and among key constituents. Recognizes value of reputation, image, public trust and corporate-social responsibility. 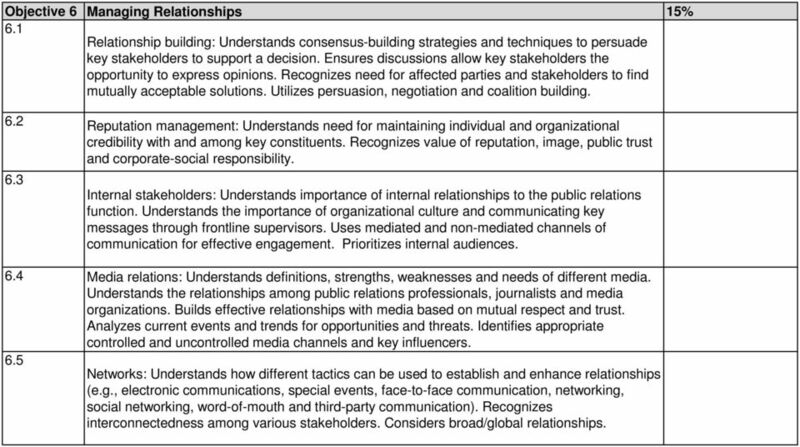 6.3 Internal stakeholders: Understands importance of internal relationships to the public relations function. Understands the importance of organizational culture and communicating key messages through frontline supervisors. Uses mediated and non-mediated channels of communication for effective engagement. Prioritizes internal audiences. 6.4 Media relations: Understands definitions, strengths, weaknesses and needs of different media. Understands the relationships among public relations professionals, journalists and media organizations. Builds effective relationships with media based on mutual respect and trust. Analyzes current events and trends for opportunities and threats. Identifies appropriate controlled and uncontrolled media channels and key influencers. 6.5 Networks: Understands how different tactics can be used to establish and enhance relationships (e.g., electronic communications, special events, face-to-face communication, networking, social networking, word-of-mouth and third-party communication). Recognizes interconnectedness among various stakeholders. Considers broad/global relationships. St. George s University 34-Credit MBA in Multi-Sector Health Management Course Description MGMT 900 Professional Practice: Most individuals in this program will not have an undergraduate business degree.